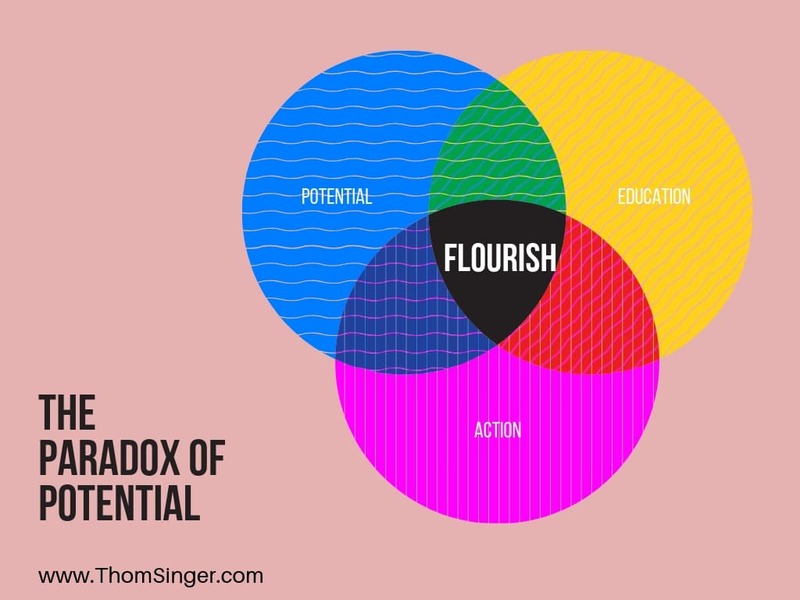 Is flourishing at work possible? If you manage a team, you need them to flourish or you experience a big gap between potential and results. Several years ago there were a half dozen best-selling books on happiness. Speakers were gracing the stages of the most prestigious business conferences telling people how to be happy. Yes, people everywhere want to be happy. Even founding father Thomas Jefferson included “live, liberty, and the pursuit of happiness” as our unalienable rights in the Declaration of Independence. Happiness. Damn that sounds nice. Who wouldn’t want to be happy? But the reality is the world throws curveballs, and you cannot be happy in every situation. It is a fools errand. I spent years wanting to be happy, and trying to dodge sadness. Yes, there were days I was happy, but I have proof that some things that make me happy do not bring me closer to my overall growth and success as a person. I recently heard author James Fell on a podcast talking about how it is not about happiness, but about flourishing. I almost fell out of my chair, as that is the word I have been using lately to tell my clients what they want for themselves and their employees. People spend a lot of time chasing the wrong things. The key thing is not always what we think. It is most certainly not potential. We want our people (individually and as a team) to flourish. When a person is flourishing they are developing rapidly and successfully. They are thriving. I have been interviewing people (in surveys, on the phone, and via my podcast) for the past eighteen months about what I call “The Paradox of Potential”. We are so focused on potential and what could be, that we often lose sight of the reality of results. Once can flourish when their potential, education and experience, and their actions all line up. This is not easy, and will not happen by accident. It takes a plan that meets passion. Then it requires other people to be supportive and encouraging, as we cannot succeed alone (no matter how many old John Wayne movies we watch). Plans are about the goals of the individuals and the group. Does everyone on your team talk about the direction they are going (alone and together?). We need others to hold us accountable and encourage us as we strive to cross the gap that exists between potential and results. If someone is not clear of the destination, they can easily take a wrong turn. Goals simply allow people to navigate their path. It is simple, you just ask “does this action take me closer to my goal or lead me away from the target?”. Passion is needed, because if you are not into what you are doing as your work, you will never be all in the game. Nobody is excited everyday about every task, but when you have that real understanding and joy, and know the reason you come to work, then you will get through the rough times and excel in the good parts. If you want your team to get to that place where they are flourishing, you have to have conversations about what this really means. There also must be a culture of support. People cannot flourish alone. When someone feels alone (even in the crowd of a workplace) they will fail to be able to reach deep inside and do more. We forget that we are connected to others, and feeling part of something is one of the strongest motivators. Companies who have regular team meetings and huddles seem to see more people flourish than those who are lost in cubicles and deadlines. Too many roll their eyes at the topic of “culture”. But in a competitive marketplace the companies who have done the culture game right seem to attract and keep talent. Additionally, they cultivate loyal customer relationships through meaningful engagement. We all like to give our business to people who are clearly flourishing. Even in our digital connectivity world, people still do business with those they know, like, and trust. But do we stop at the superficial when it comes to knowing others in the workplace? Getting to know someone used to be a process. It took time to get to know somebody. Now we read their LinkedIn profile and assume we know all that we need to know. What we really know is their resume. That does not necessarily bring us to like and trust. Thus, when you can get to those, you win. Having others (inside your company and outside your company) know you, like you, and trust you is the competitive advantage that your competition would pay big money to obtain (FYI, it cannot be bought). In my presentations on “The Paradox of Potential” there is a lot of conversation about exactly this process of getting teams farther across the gap between potential and results. When teams get focused and together make progress, it is easy to see how people begin to flourish. Thom Singer is an engaging keynote speaker. Find out more at www.ThomSinger.com.